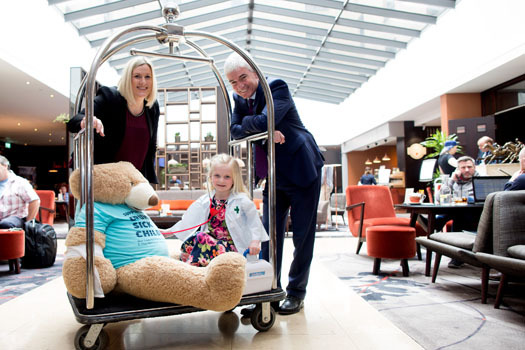 Dalata Hotel Group, Ireland’s largest hotel operator, is renewing its partnership with Children’s Medical & Research Foundation Crumlin in Dublin for a third consecutive year. Over the last two years, the hotel group has raised €419,000 for CMRF Crumlin with an aim to exceed half a million by the end of this year. Dalata’s corporate social responsibility model sets each of its hotels a specific fundraising target in competition with one another. This year staff have organised a cycle of the entire Wild Atlantic Way, the now annual Galway Ball and a Carrauntoohil climb with over 100 staff members signed up. Funds raised from the partnership have been invested to help combat Neuroblastoma, a cancer of the nervous system that primarily affects children aged five and younger and is responsible for approximately 15pc of childhood cancer deaths. Dalata is partnered with CMRF Crumlin in the Republic of Ireland, Cancer Focus in the North and Great Ormond Street Hospital in London. The combined total for fundraising across all regions over the last two years has been €563,000.